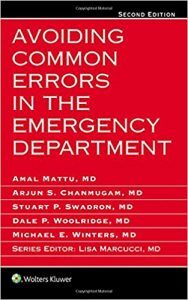 In a conversational, easy-to-read style, Avoiding Common Errors in the Emergency Department, 2nd Edition, discusses 365 errors commonly made in the practice of emergency medicine and gives practical, easy-to-remember tips for avoiding these pitfalls. 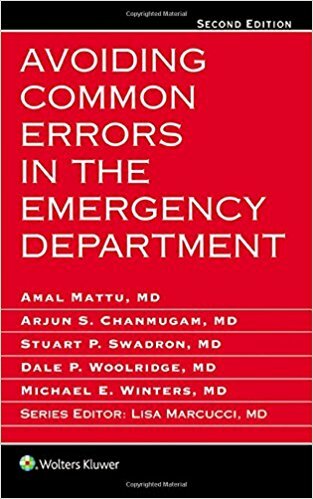 Chapters are brief, approachable, and evidence-based, suitable for reading immediately before the start of a rotation, used for quick reference on call, or read daily over the course of one year for personal assessment and review. Coverage includes psychiatry, pediatrics, poisonings, cardiology, obstetrics and gynecology, trauma, general surgery, orthopedics, infectious diseases, gastroenterology, renal, anesthesia and airway management, urology, ENT, and oral and maxillofacial surgery. Completely revised and rewritten by many new authors, as well as returning authors who bring a fresh perspective to new subjects. New key points at the end of each chapter present must-know information in an easy-access, bulleted format. Ideal for emergency medicine physicians, residents, and attendings; emergency nurse practitioners, PAs who practice in the ED, and primary care physicians in urgent care centers.